In a medium saucepan dissolve the bouillon powder and a pinch of salt in 2 cups of water. 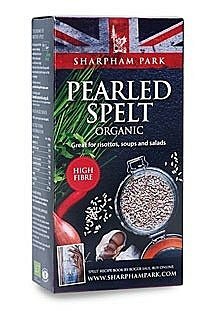 Add the pearled spelt and bring to the boil over a medium heat. Don't allow it to boil too rapidly as this will cause the spelt to overcook on the outside before being cooked all the way through. Once at a gentle simmer, allow the spelt to cook for 22 minutes. Meanwhile, rinse the courgettes and thinly slice to approximately 3mm. In another medium/large saucepan gently heat the butter and the olive oil, and then add the sliced courgette. Try not to let the courgettes colour here; low and slow cooking is the idea. They will gently soften and sweeten, and become so beautifully juicy and delicious. Keep a lid half on/half off, to prevent too much moisture from evaporating. Peel and mince the garlic and add this to the cooking courgettes. Season with salt and pepper. Strip plenty of fresh thyme from its stalk; more is more here, and I go for a almost a full tablespoon of thyme leaves. Add these to the courgettes and stir well. With the lid mostly on, yet with a slight gap, allow the courgettes to cook for 22 minutes, stirring from time to time. With any luck the spelt and the courgettes will be ready at the same time. Drain the spelt and allow the steam to billow off for a minute or two. I like to stir a final knob of butter through the courgettes before serving. 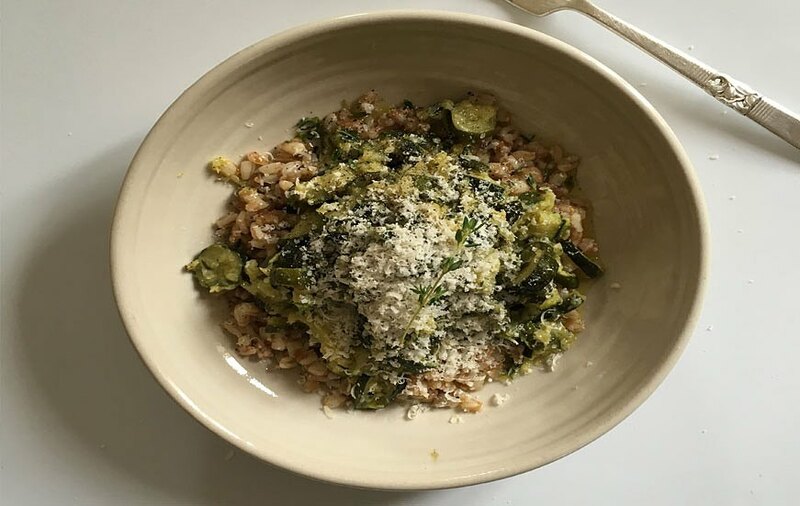 Serve in warmed bowls with a generous grating of fresh Parmesan over the top, lots of black pepper, and a few extra thyme leaves if you wish. Outrageously delicious comfort food, best eaten on the sofa!